Mostly tender perennials of herbaceous or shrubby growth, principally natives of Chile and Peru, and belonging to the Snapdragon family, Scrophulariaceae. Calceolarias vary in height from 6 in. to 3 ft. The flowers are slipper-like and are mostly yellow in color, with the exception of those of the herbaceous Calceolarias, which display a wide range of colors. 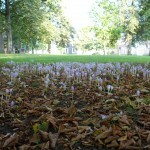 The flowers of the different kinds also vary in size, those of some averaging 2 in. in diameter, while others are not more than 1/2 in. across. 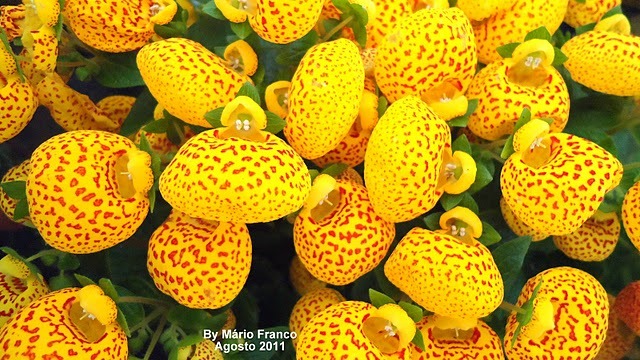 The name, Calceolaria, is derived from calceolus, a slipper, and alludes to the slipper-shaped flowers. Calceolarias are divided into two distinct groups, consisting of herbaceous, or soft-stemmed kinds, and shrubby kinds. Of the herbaceous kinds the most popular are those large-flowered greenhouse plants which bear brilliantly colored blooms in April-May; they were originated by crossbreeding between C. corymbosa and C. crenatiflora. By continuous selection a magnificent race of plants has been obtained: these produce immense blossoms of varied coloring including rose, apricot, terra cotta, yellow and brown. Some are self-colored, while others are splashed with harmonizing or contrasting colors. These Calceolarias are raised from seeds sown annually in early summer and are grown in pots in the greenhouse for spring and early summer decoration. The shrubby kinds, particularly the yellow flowered C. integrifolia, popular in Europe for bedding out in summer, may also be raised from seeds, though they are generally propagated by cuttings. As Greenhouse Plants. Both herbaceous Calceolarias and shrubby calceolarias are grown in greenhouses. The former are most popular and easier to handle, being treated as annuals. They have had many different names including C. hybrida, C. herbacea and C. herbeohybrida. Botanically they are regarded as forms of C. crenatiflora and C. arachnoidea. Their lady’s-slipper flowers are very colorful. This type is compara tively easy to grow provided it is given a cool, airy environment and a minimum temperature of 45-50 degrees. Seeds of herbaceous Calceolarias may be sown from April to September. 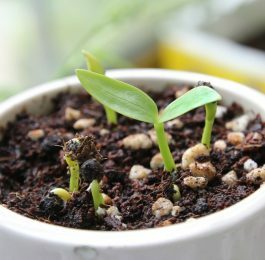 From the early sowings, plants may be grown to finish in 9or 10-in. pots and will, while in flower, measure as much as 2-2 1/2 ft. high and will spread as far when staked out. A good-sized plant in a 5to 6-in. pot may be raised from a sowing made about August the first. Sow the seeds on a screened mixture of two parts garden loam, one part peat moss and one part sand. Press the soil mixture in the container moderately firm, leaving a level surface. Soak the soil before seeding and sow as soon as the muddy condition has gone. Scatter the seeds thinly and as evenly as possible over the soil surface. 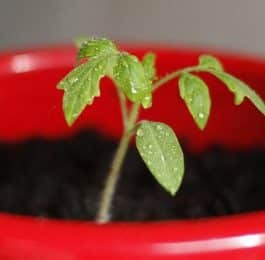 They are very tiny so no attempt should be made to cover them with soil; but a sheet of glass over the container, and it covered with a piece of paper, will tend to conserve moisture. Turn the glass daily to remove excessive moisture. Should the soil surface, for any reason, begin to dry, place the container in a basin of water and allow the moisture to soak up from below. When the seeds show signs of germinating remove the paper and place the container where there is moderate light, but avoid direct sunlight. Raise the sheet of glass so that air may reach the seedlings and in 2 or 3 days the glass may be removed. Indirect sunlight and moisture in the soil are all the seedlings need until they can be transplanted, which will be when two pairs of leaves have formed. Space them 2-3 inches apart in a soil mixture that is two parts sandy loam and one part humus. In 5-6 weeks they will be ready for potting singly into 3-in. pots, using similar soil. A shaded cold frame or shaded and airy greenhouse is best for them until October 15 (in the vicinity of New York City) after which they will endure full sunlight throughout the winter months. As soon as the roots show signs of forming a network around the ball of soil, a second or final potting should be made in soil that is well drained and rich in humus, and that has a 4-in. pot of 5-10-5 fertilizer (see Fertilizers) added to each bushel. Final potting should be done by early November; and after the New Year, when roots become plentiful, a complete fertilizer, in very weak solution, may be applied once a week until the flowers show color. Plants with heavy flower heads require support by thin bamboo or wire stakes that are concealed by the foliage. Annual Kinds. Although usually grown as greenhouse annuals or biennials the herbaceous Calceolarias mentioned above are truly perennials. There are, in addition, some charming annual Calceolarias. Most popular of these are C. mexicana and C. scabiosaefolia. The former is a native of Mexico, the latter of Chile and Ecuador. 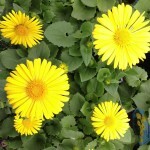 Both are very easily cultivated in a cool greenhouse or out of doors in summer. Seeds sown at any time of the year give plants that bloom in 35 months. They thrive in fertile, porous soil kept reasonably moist and need shade from strong sunshine. C. mexicana grows to a height of about 1 ft., C. scabiosaefolia to a height of about 2 ft. Both form dainty bushy specimens that bloom over a long period. Their flowers are pale yellow and about 1/2 in. in diameter. In greenhouses these Calceolarias self-sow freely, and it is common for volunteer seedlings to spring up under the benches, in gravel or cinders on the benches, and in similar locations. Shrubby Calceolarias grown in greenhouses are named C. Stewartii (yellow flowers) and C. Medfordii (maroon flowers). There is also a pink-flowered form, probably a seedling from C. Medfordii. This group, which has been given the name C. fruticohybrida, was derived from the crossing of several species. The method of propagation of these shrubby types is to root cuttings taken from the new growth which starts soon after the flower heads are cut off. This will be from June to August provided the old or stock plants have been kept in shade, and kept moderately moist at their roots. These stem cuttings root readily in sand in a moist atmosphere where there is shade. After roots form, the method of culture is the same as for the herbaceous type of Calceolaria. A 6-in. pot, as a final potting size, makes provision for a handsome plant. Calceolarias for the Rock Garden. These are of dwarf, tufted habit and thrive in England in semishady positions in the rock garden. They may be useful in restricted areas of the United States where winters are mild and summers cool. They require a well-drained gritty soil and are propagated by division of the roots in spring or by seeds sown in pots of soil placed in a frame in June to provide plants that will bloom the following year. The chief kinds are: C. biflora (plantaginea), 12 in. yellow; C. Darwinii, large yellow flowers spotted with chestnut-red, 4 in. ; C. polyrrhiza, 9 in., small yellow flowers with brown spots; C. John Innes, 6 in., large golden-yellow flowers, all blooming in June—July.